I’m not sure what Harvey’s New York Bar and Grill think they’re producing with their array of tasteless meat filled burgers but it’s not good news. After this visit, it was my second and last visit to the American style restaurant due to foreseen reasons but I was weakened by the persuasion of my peers, this won’t be happening again. Something which seems to be reoccurring, is my choice of pulled pork on my burgers, and the burger I had chosen at Harvey’s was in fact primarily pulled pork. 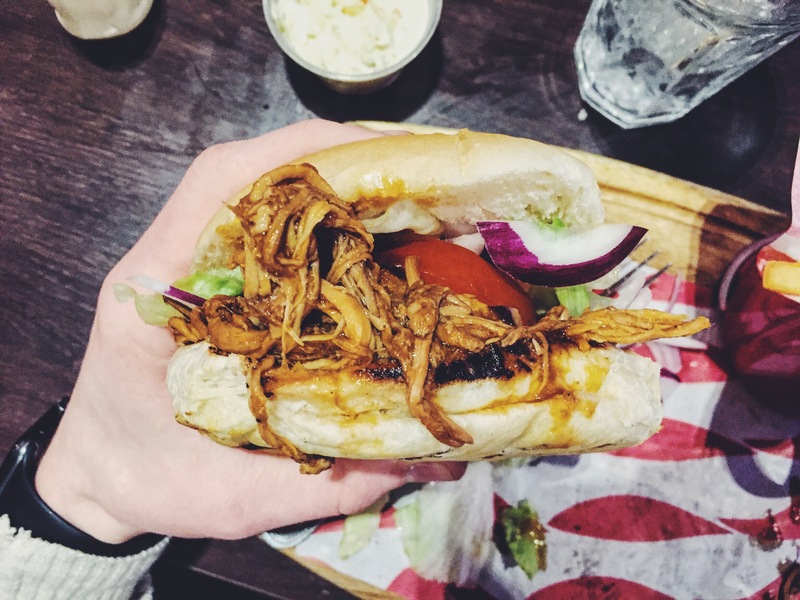 ‘Pulled Pork’ – shredded pork, piled high on a toasted roll. Served with Harvey’s BBQ sauce and onion rings. I’ll start with the onion rings, as they seem to be the hardest to write about. Flavoursome, chewy, small enough to devour without fuss and all round delicious, shame I didn’t order more. The bun which encased the meat, was not toasted and looked/felt like 1 of 4 bread buns you can pick up from a supermarket, that’s not what you want, is it? As they explained, the pork was in its masses, way too much for the ‘toasted bun’ which mean’t towards the end of the burger I was using a knife and fork to try and finish it off, not what you want. If you are looking to eat an average meal with a Harley Davidson hung above your table. Then by all means, waste your money on Harvey’s New York Bar and Grill. I rate the ‘Pulled Pork’ at 1 out of 10. Widely praised for their extravagant and immoderate burgers, the constant queue to dine in their establishment makes the name ‘Almost Famous’ a little contradictory. 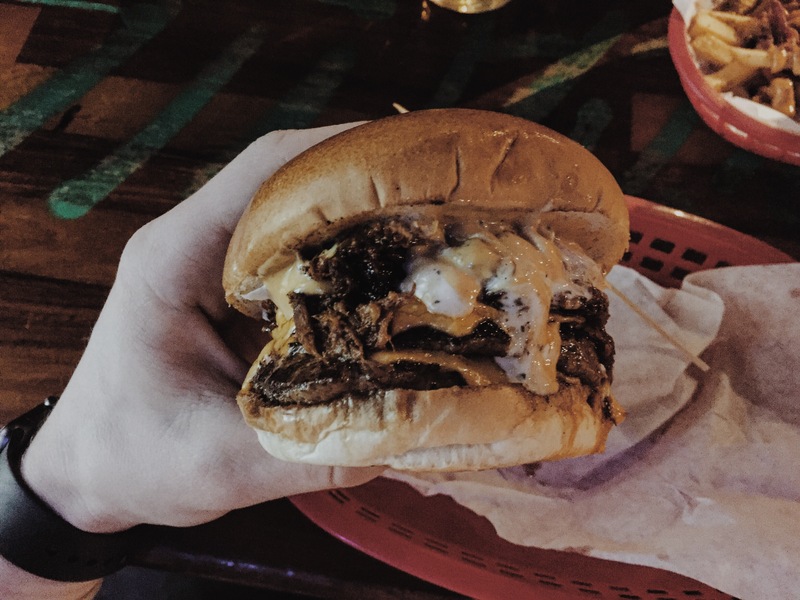 On each visit to Almost Famous, it’s always an extreme idie experience with candy filled table tops and a 20ft PVC gorilla, sitting comfortably in the centre of the restaurant. Almost Famous’s menu makes it near impossible to easily choose your meal, with a large range of burgers, hot dogs and fries. The new, prompt table service meant we had ordered and received our food in the space of 20 minutes, impressive. I had chosen the ‘Triple Nom’ which included – Cheese, Pulled Pork, Redneck BBQ & Famous Sauce. Doesn’t sound overly exciting but how that’s misleading. Already dripping with sauces and pulled pork falling out of the sides, eating it was quite a mission. The pulled pork gave a little heat to the burger but with the burger also including coleslaw, it wasn’t overwhelming. The bread was delicately soft, a tad greasy but your hands will inevitably gather grease as you tackle the burger. I guess that’s why there is a mandatory roll of handpaper on the table? Exactly what was expected, Almost Famous is something that stands alone for good reasons amongst many other burger establishments, the ‘Triple Nom’ gets an 8-10.